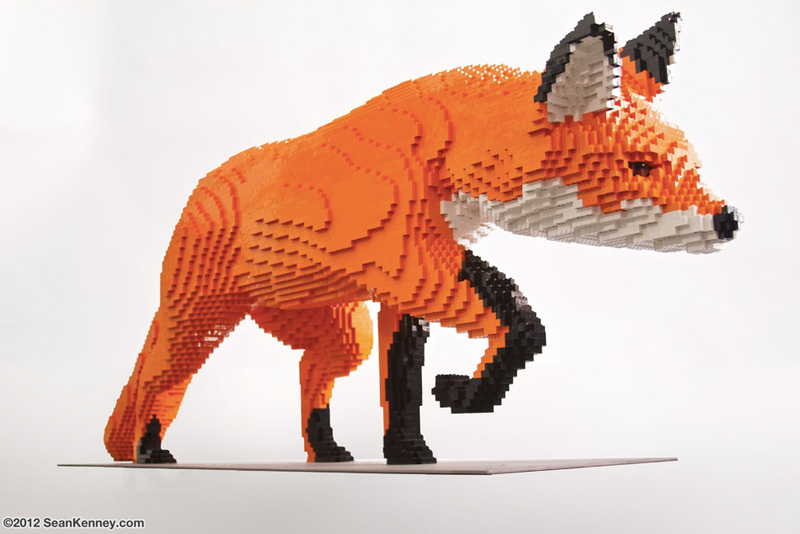 This giant sculpture of a fox is nearly 6 feet long and contains 17,547 LEGO pieces. He was built together with a giant rabbit, cunningly stalking the poor little fellow down. Did you notice the evil little glint in his eyes? The sculpture is built around a steel frame to secure it to the ground and help withstand overly curious visitors and extreme weather. Ji Yoon, above, did most of the construction of this sculpture, and my assistant Jung Ah, below, did most of the design. The sculpture was assembled in my New York City art studio, then custom-crated in museum-quality exhibition crates for my new show, Nature Connects, which is currently touring the United States.